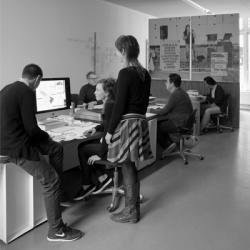 Kummer & Herrman is an office for design founded in 1998 by Jeroen Kummer and Arthur Herrman. Since the start they gathered around them a team of professionals who share their love for top-notch projects for a wide range of international clients. They do not limit their work to a specific medium. They grew up with print, but are living in a rapidly changing world, and projects often ask for a combination of media. Regardless of the means or the media, they firmly believe that a good design should be based on a clear and strong idea, executed in a consistent manner. The aesthetics should never get in the way of bringing across this idea. Recently, Kummer & Herrman has been increasingly involved as designers in the field of photography. They are collaborating with photographers, publishers and curators, and are working on exhibitions, visual identities, apps and websites. Over the years, they gathered a lot of international acclaim for their work. They were nominated and awarded numerously at the Dutch Theater Posters Award, Best Annual Reports, Best Dutch Book Designs, Red Dot, Deutscher Photobuchpreis and the European Design Awards, just to name a few. At the moment, they are considered as one of the leading agencies worldwide for photobook design.